I have some more interesting pictures from yesterday, and since today was mostly a long day at work and a car repair, I choose fun pictures instead! Sophie is always a riot on our outings. She's a dog with a ton of personality. And Sue says she particularly likes me, which tickles me pink. 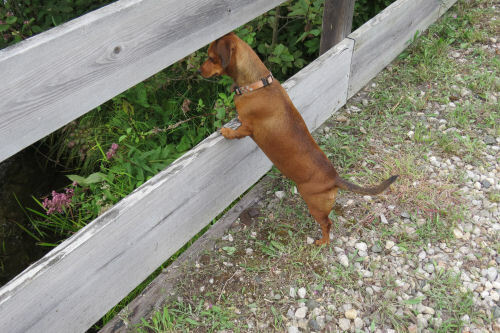 One really funny story from yesterday is what happened when Sue and I got to her house. I met her at work and we went there together. 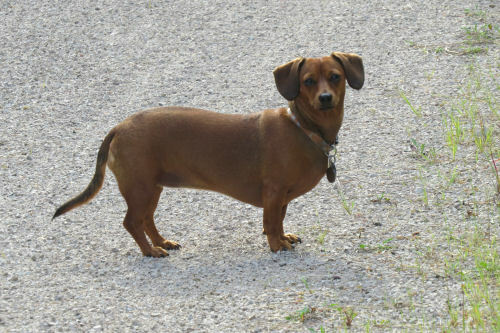 When she opened the door, Sophie saw Sue and started dancing around the way you'd expect any happy dog would greet her human. Then she saw me and it was the funniest thing! She pulled back her lips to show her teeth- not far enough for a snarl or growl, but just so part of her teeth showed. It looked for all the world like an extra-joyous smile. She did it over and over until all the initial greetings were made. 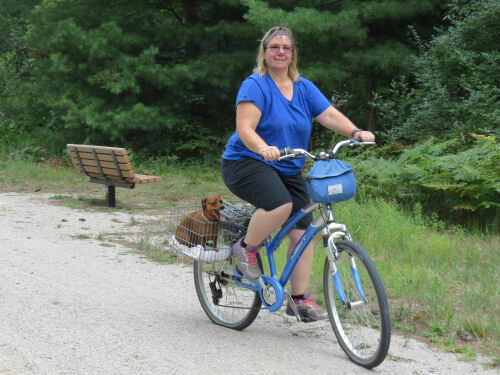 And as soon as her outside duties were done, she spent the rest of the time that we weren't biking parked in my lap! 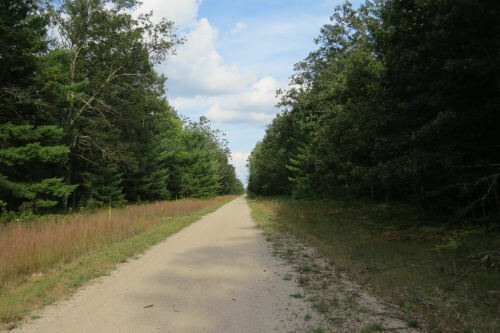 Just to orient you again, we rode our bikes on the Pere Marquette Rail Trail which is the continuation of the live tracks in back of my house. They are only live as far as Baldwin, where they turn south to Grand Rapids. 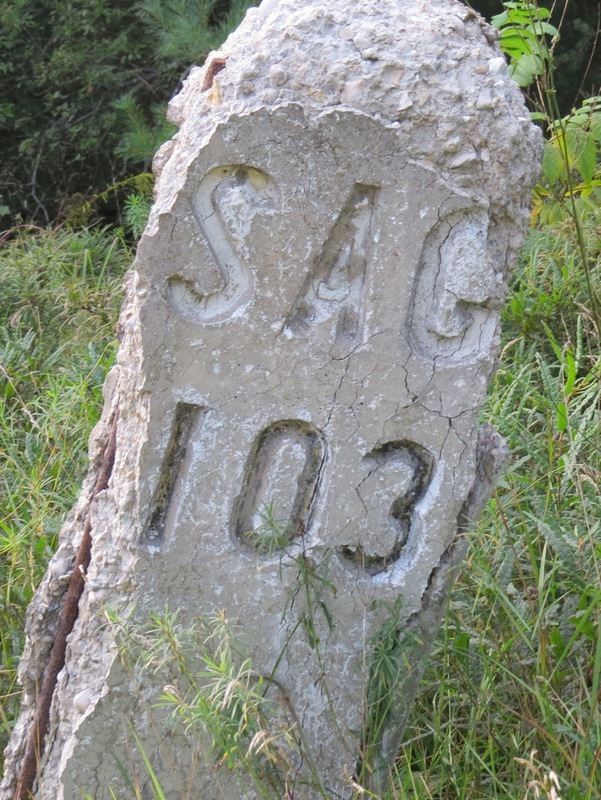 But the old mile markers along what's now trail show the distance to Saginaw, just like out back here. You know I like to find beauty in the ordinary things. 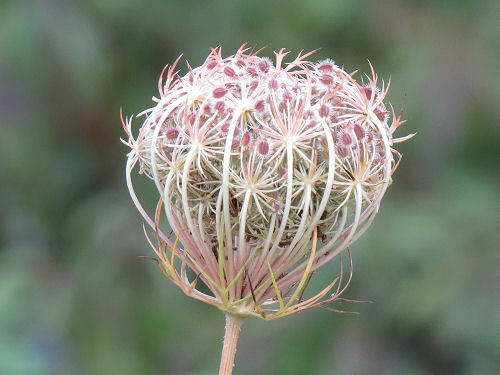 Here's a Queen Anne's Lace going to seed. 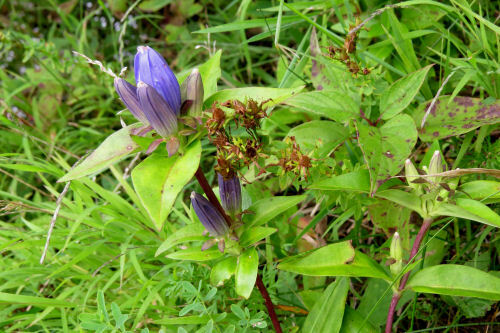 Sue made a really neat find, this bottle gentian. Probably the most common gentian, but not seen all that often. 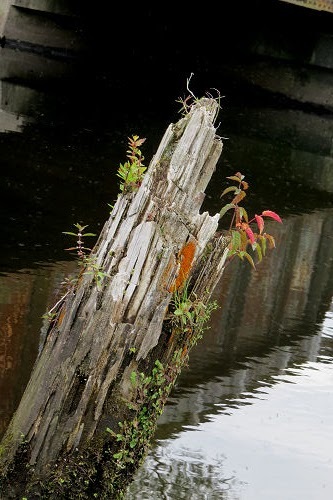 I liked this old piling in the Baldwin River. It's busy turning itself into a small terrarium. Sure we were there for the exercise, but the experience is always more than just riding the bike. Not enough hours in the day. I'm sure you know that! 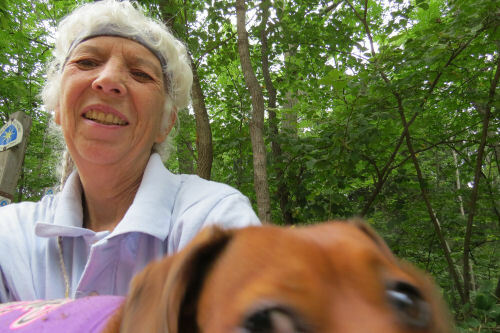 Spent time with Sue and Sophie again this week after Sue got off work. Today we went for a bike ride. 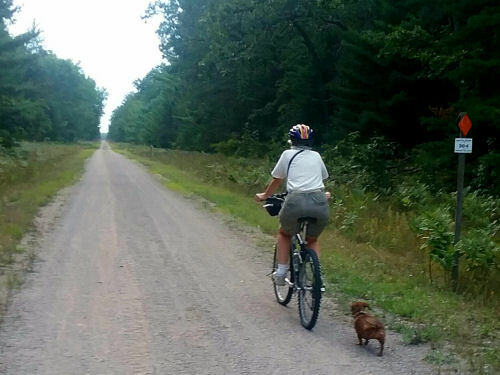 We rode 10 miles on the Pere Marquette Rail Trail where I took a short walk last week. Sophie rode in the basket on the way out, but she kept whining and really wanted to be down. So she got to run about four of the miles on the way back. That seemed to be what she wanted. We rode the five miles to Idlewild (Broadway St) without stopping, but I wanted to take pictures on the way back, so we stopped fairly often. 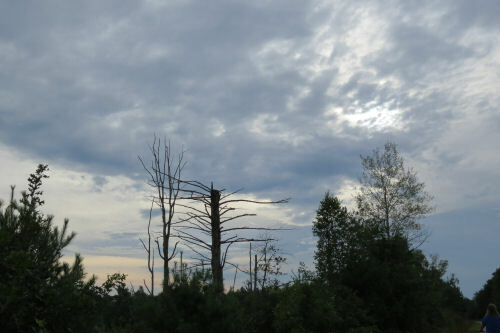 I liked the branches against the sky. The day had been pretty warm, but by then the temperature was really nice for a bike ride. It's starting to look like fall. This is the view across Foreman Lake. 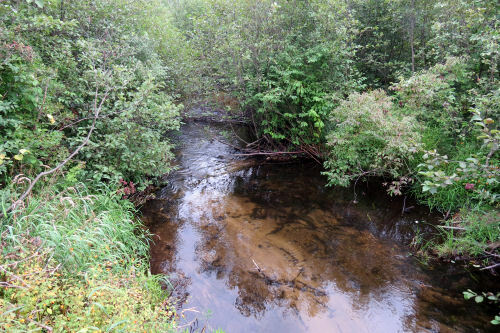 Sanborn Creek is a nice clear little stream. Sophie says, "I'll watch for the fishes if you catch me one, Mom." 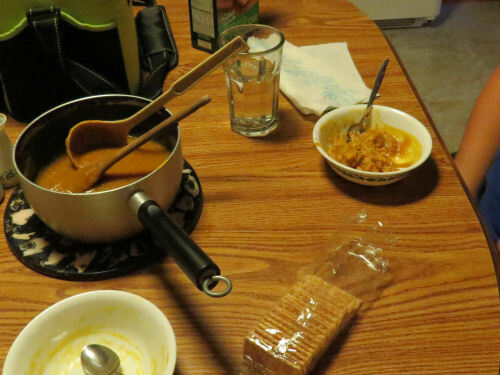 When we got back, we went to Sue's house and had butternut squash soup for dinner. A really nice end of the day. Wish we lived just a little closer together, but we're managing to squeeze a few adventures around our work schedules. You'll probably see more from this outing tomorrow. There was some other neat stuff too. I'm beat. Today was non-stop and tomorrow will be the same. Just a couple more weeks of this Tuesday/Wednesday rat race. I may be pretty high energy, but I can't go on day after day indefinitely. Need spaces between. So enjoy this calming view of the Big Sable River, taken Sunday. It's the kind of place that can soothe your soul. Remember this picture? 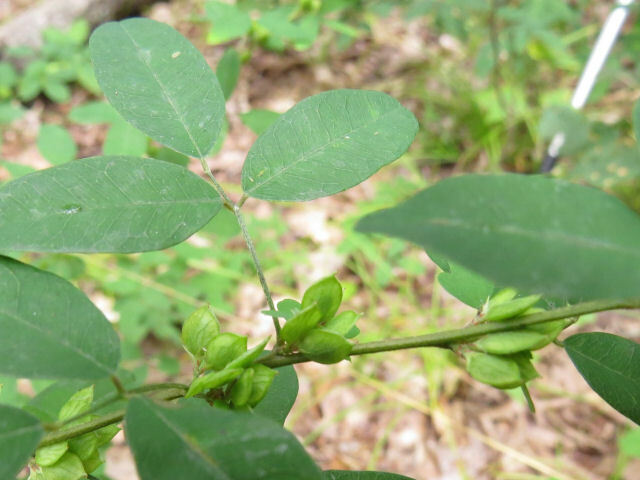 I called it Wand-like Bush Clover. 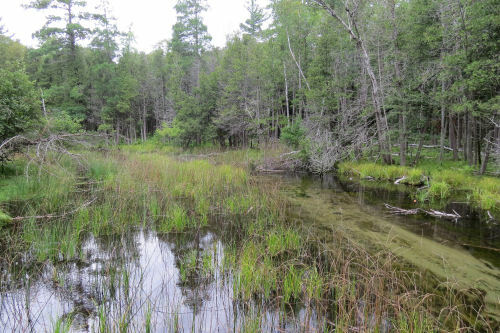 Well, I now have the picture that shows what the habitat looks like while growing. And one with those distinctive seed pods. 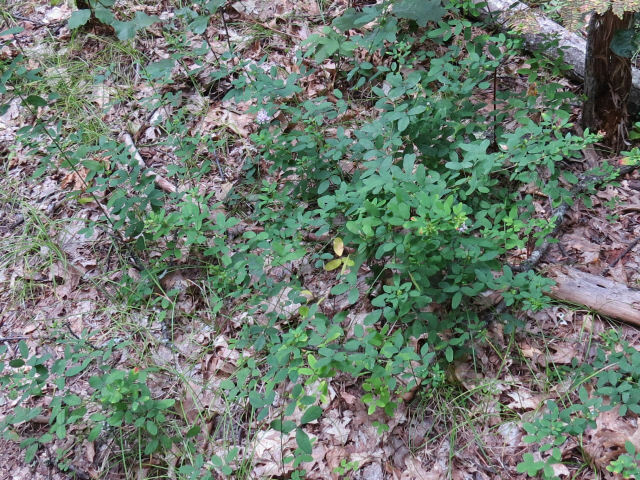 The problem is that it doesn't really match any of the Lespedeza exactly. 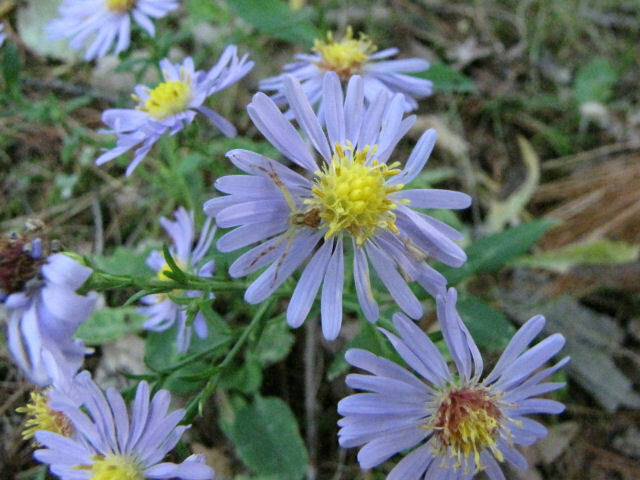 The Michigan Flora book says that hybrids of intermedia with violacea produce the flowers with those long wings. And intermedia had been renamed frutescens. 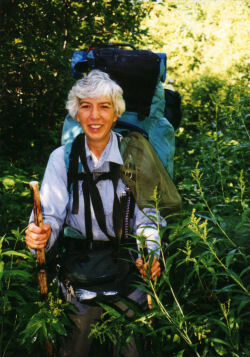 The on-line Michigan Flora guide doesn't even include the species in Michigan. But, here's this plant. 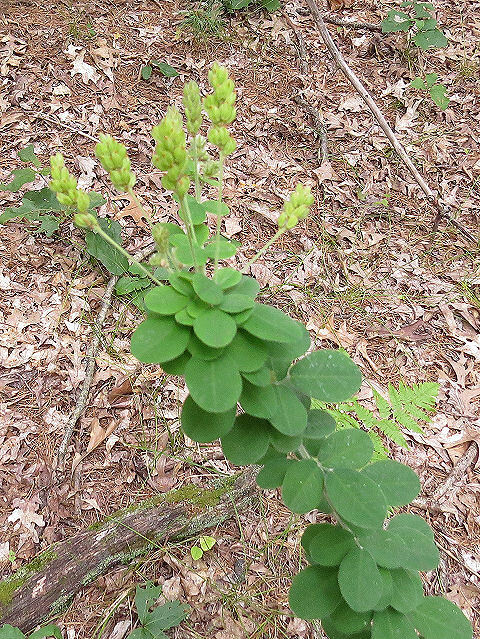 Clearly a Bush Clover. Sigh... I can't really go any farther without one of my real botanist friends, who mostly don't like fielding questions from amateur me. It grows straight up and then sends up stalks for the flowers. One of them was opening yesterday. 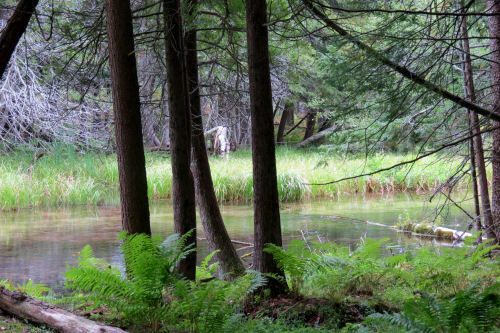 I've seen a third species in the area, but don't have pictures of it. It's back to work tomorrow. I don't really feel ready for that. 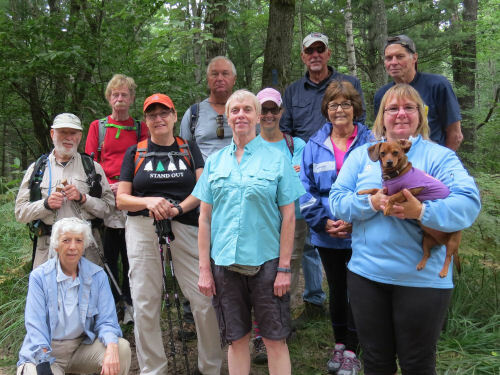 Eleven of us and Sophie dog hiking today. We did 9.8 miles. We got sprinkled on a few times, but not enough to even get wet. The temperature was great- in the 60s, and even the purists survived the 2.3 mile roadwalk in the middle that we'll probably never get rid of. Too many little cottage properties. 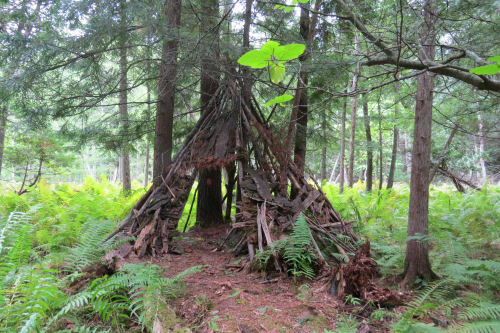 We found another teepee someone has built. This is pretty extensive construction with a bench inside and a raised walkway to reach it. I don't think it was there when I hiked this piece last October. I always love crossing the Big Sable River. It's shallow and lazy here. It always makes me feel peaceful. Then we got to the roadwalk section, but there were actually some interesting plants along that. 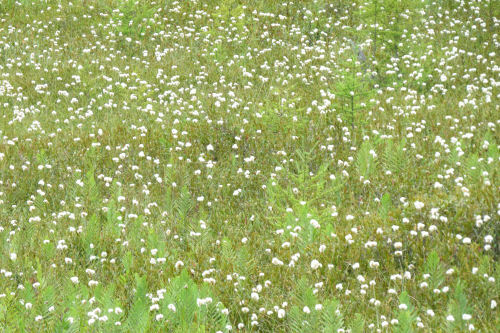 This wetland is full of Cottongrass (and leatherleaf and marsh fern). 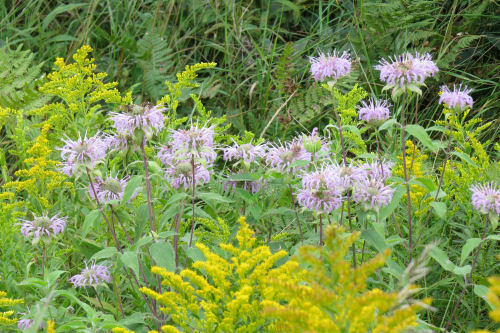 Some Bergamot among the goldenrod. 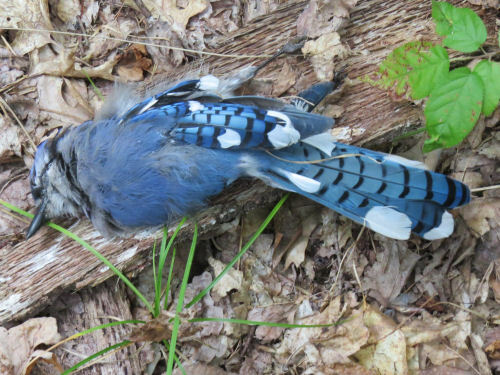 We found a dead blue jay beside the trail. Sad, but it gave me a chance to picture the beautiful colors of its feathers. 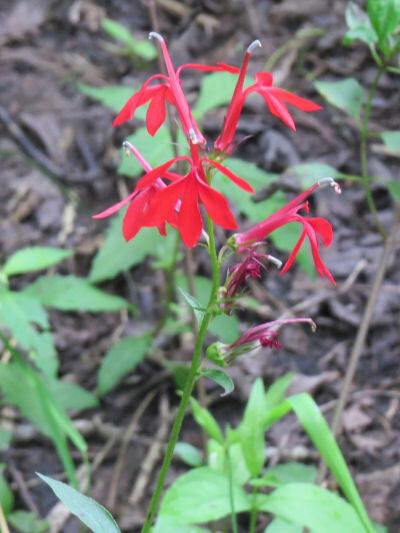 Followed soon afterwards by brilliant Cardinal Flower in an intermittent stream that is just a damp spot at this time of year. Did we have a good time? You betcha. But Sophie was trying to hold me down and lobbying for a little longer rest stop when we left 5 Mile Road! My next newspaper column is going to be about the legacy of Martin Gustave Johnson who founded Camp Martin Johnson, near Irons, Michigan, through the Chicago YMCA. 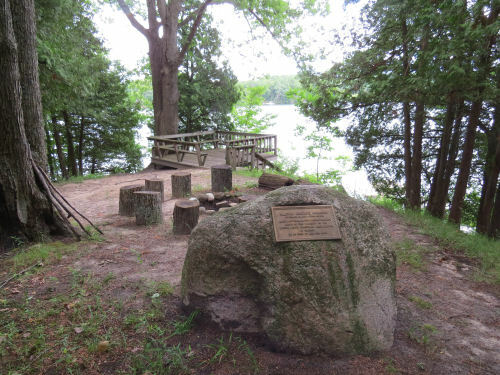 The camp closed permanently in 1980, was sold and subdivided. 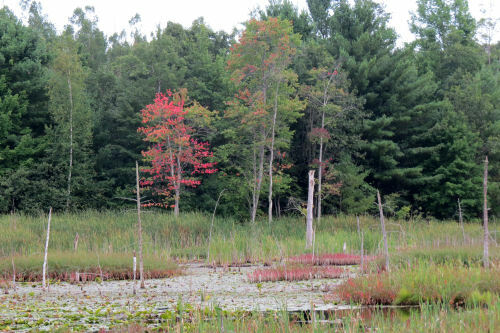 The land is now a housing development on Big Bass Lake. Today, I went to Irons to the house he built in 1901. 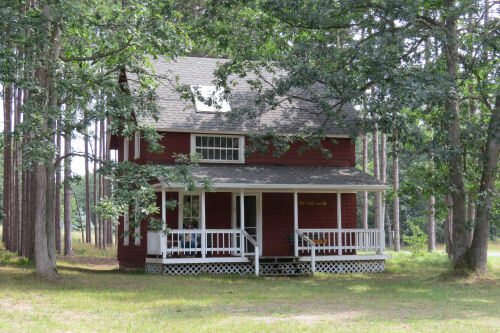 It was on the camp property, but was saved from demolition by a group of women and moved to the town. It's now a small museum. I became re-interested in Martin Johnson a couple months ago when I interviewed a lady who lives on what used to be camp property. She showed me his grave site. Although he died in 1931, I still think it's remarkable that it was permitted for him to be buried there, and not in an established cemetery. 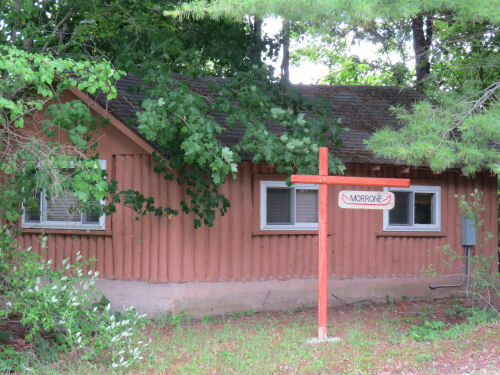 There is also one of the camp cabins that has been moved from its original location, but at least it's preserved. 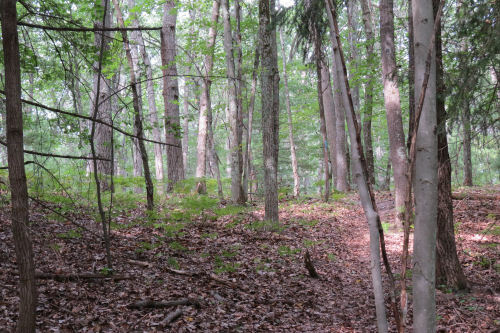 On the way home, I took a quick little walk on the North Country Trail. This is a piece I don't see too often, although it will be on our group hike tomorrow. 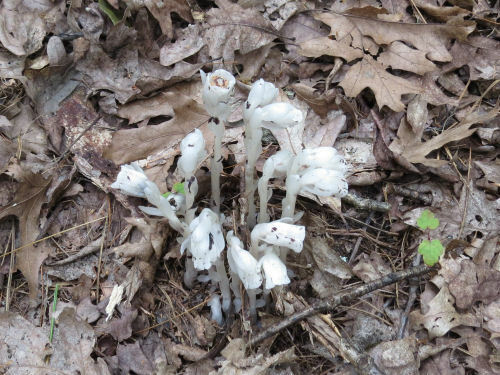 Here's a pretty little clump of Indian Pipe, with one stalk lifting its head, getting ready to go to seed. And, who knew I'd see a new plant so soon after the last one? Actually, I've seen the leaves before, but never the flowers. 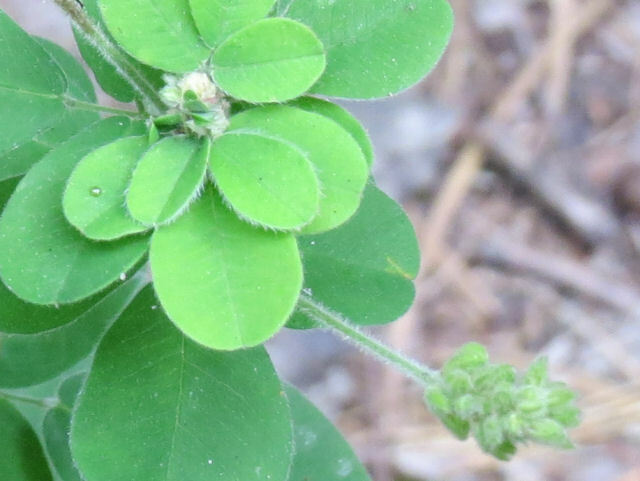 I knew it was one of the bush clovers, but which one??? 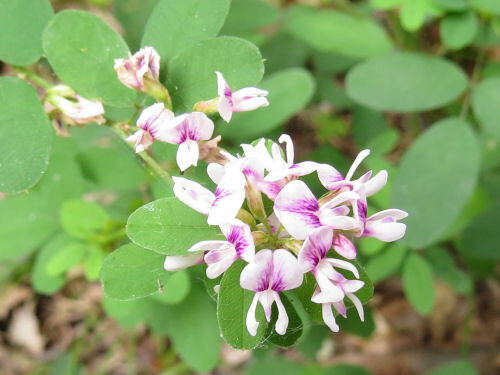 The colors can vary, but the long wings on the lower flower petals and the round leaves mean that it's Lespedeza intermedia, or Wandlike Bush Clover. The seeds are pretty distinctive too, but my pictures of those aren't in focus. Nice that I'll get another chance at pictures tomorrow. Now I have to get busy and read some more literature I brought home so I can write that column! 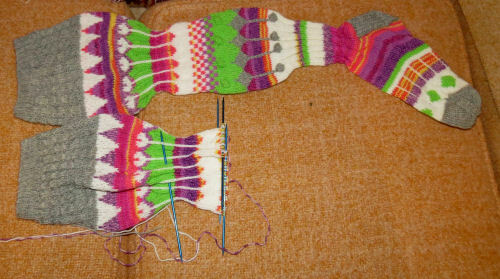 You may remember that there was a sock project in the works. I did warn Michelle that it might take me a couple of years to get these done. She said she was good with that. If you know me, you know I was at least being honest with her. Got the first one done a long time ago (February). Here's where I am on the second one. I did do a little tonight. The cooler weather makes me want to handle yarn. Off to work now! Short post tonight. Came home with pictures of a plant I did not know the other day. You may have seen my posting on Facebook to elicit help. Only got more questions. So... tonight I tried some serious identification work with a real key. I haven't had to do this for a while. Tedious. Have spent all evening. Maybe have a match. 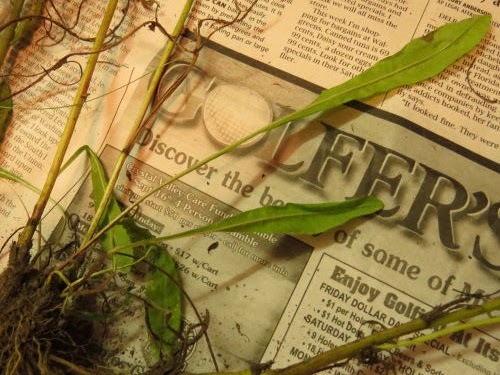 Would really like one of my pro botanist friends to check it out when I get a chance. My first impression was that it isn't a hawkweed (too many branches) or a wild lettuce (leaves aren't toothed deeply enough). That said, there could be exceptions to common examples. 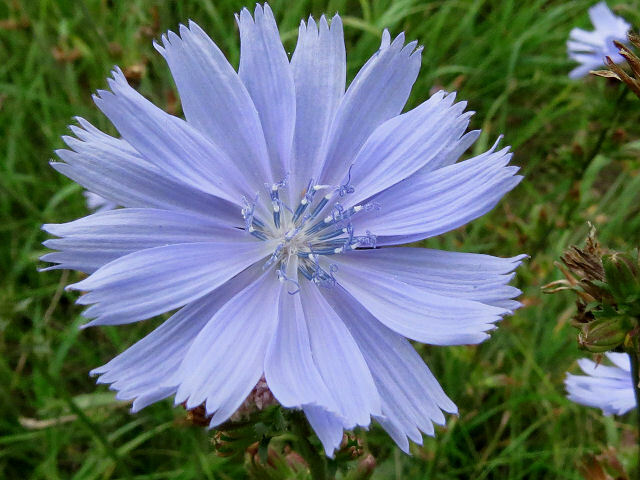 What it looks most like is some sort of double yellow Chicory, if you take the leaves and stems into account. Not an option. I tried both the key in Michigan Flora, and the key in Illustrated Flora of the Northern United States. The second one is very old and outdated as to names, but there are drawings for every single species, so you can often get an ID, and then check on line for updated naming. Anyway. No question it's in the Compositae family. I guess I won't explain that too much, but it doesn't narrow things down much. There are over 20,000 species and it's either the largest or second-largest family of plants in the world. OK. Now let's get down to business. I've greatly simplified the questions... there are many many hedges of the bets. Key division 1: Are the heads flat ligulate (outer flat strap-like extension of the corolla- it's the outermost "petals" with the pinked edges) flowers, or are they ray and disk flowers? Think Chicory vs. Aster. Definitely more like Chicory on the left than the Aster on the right. That puts us in Group A, now we start over. Key division 1: Pappus or not? What's a pappus, you ask? 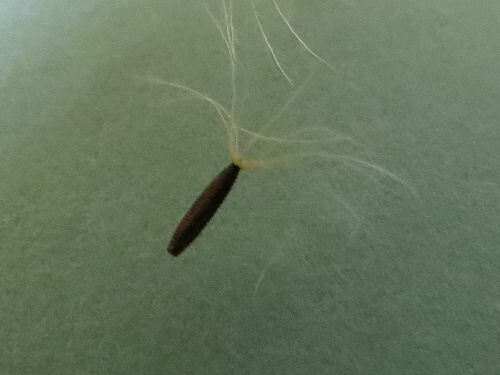 It's the silky hairs at the top of the seed pod (from now on known as the achene). Although milkweed aren't in Compositae, the pappus is like those hairs that carry the milkweed seeds on the wind. Got it? Definitely a pappus. Because we chose pappus, key items 3 and 4 are out of the question. Our next poser is Key division 5: Pappus composed of scales and bristles, or pappus composed entirely of hairs or bristles. This one was pretty easy. No scales, all hairs or bristles. On to number 6: Pappus at least partly of plumose hairs (feathery), or pappus entirely of simple bristles- at most some are barbed. Hmmm. This one gets tougher. Under my dissecting scope, I could see some branching at the ends of some of the bristles. So I guess it comes down to how much branching. Here's where one starts fudging. 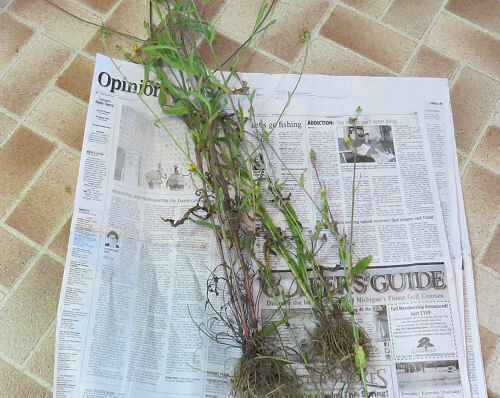 It helps to have a basic idea of what kinds of plants are in the various genera. The feathered bristles took me to Krigia (native dandelion), Hypochaeris (cat's ears), Leontodon (fall dandelion), Tragopogon (goat's beard) or Picris (Ox-tongue)- not the first four... it just doesn't look like those plants. I assume you don't want the full run-down, at least tonight. The only one I didn't know was Picris. The simple bristles took me to a long list of genera. I decided to go with simple bristles. This eliminated key questions 7-9. 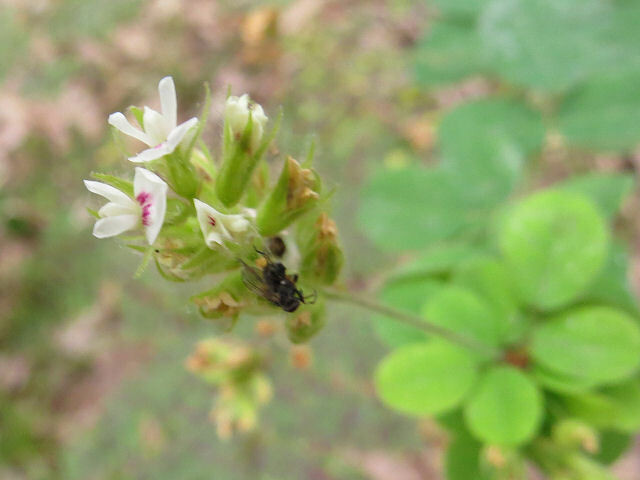 Key division 10: Solitary heads with basal leaves, or multi-headed with leaves basal or along the stem? Easy. Leaves along the stem and many heads. Question 11 eliminated. As you can see, when I said I got serious, it means I went and dug up a few plants. No one is going to care. There are lots and they are growing along a roadside. Key division 12: Leaves all or mostly basal, or leaves all or mostly along the stem. Easy- along the stem. Key division 13: Involucre at least 2/3 as broad as long, or involucre at least twice as long as broad. The involucre is the "cup" of green things that hold the flowers. No clear answer. The left one looks long and skinny, the right one, not so much. Back to making choices. 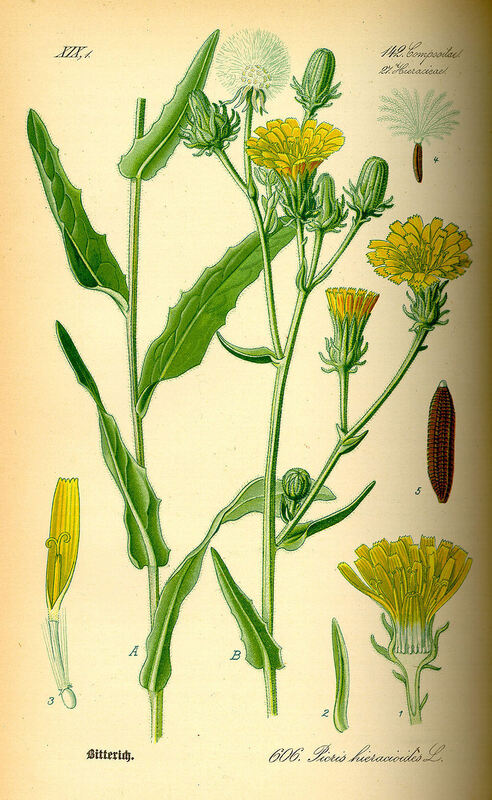 Broader ones lead me to Hieracium (hawkweed), Crepis (hawk's beard), Sonchus (sow-thistle), Chondrilla (skeleton weed), Prenanthes (rattlesnake-root), and Lactuca (wild lettuce). 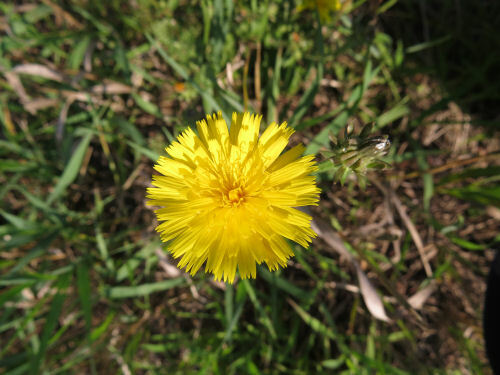 Not like any of those except possibly Crepis, which I didn't really know. I decided to go with Crepis. Here's where everything went south. If you have the ripe achenes, they can really be a help with identification. And I was very careful to bring some home. I wasn't able to get a picture through the scope, but I did a drawing, with the pappus still attached. Definitely bumpy, definitely has a few ribs, maybe five. No beak (some sort of extension on the top). Each achene is 2 to 2.5 mm long (without the pappus). With the nice pictures in Illustrated Flora, I figured I was all set. Nope. 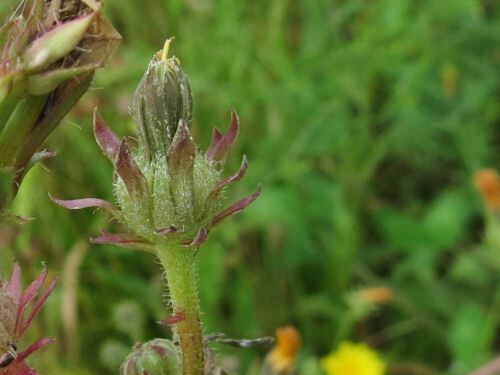 All the Crepis have lots more ribs on the achenes. Sigh. I was ready to give it up for the night. Then I decided I should go back and look at Picris. The Michigan book says this was accidentally introduced from France, and has only been found in a few places around the state. So I had dismissed it earlier. But. But! 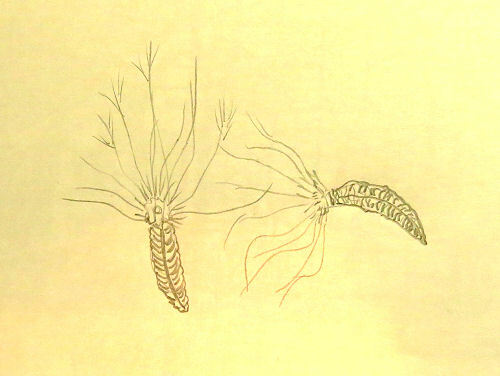 It is in the Illustrated Flora, and the drawing of the achene is a really good match. 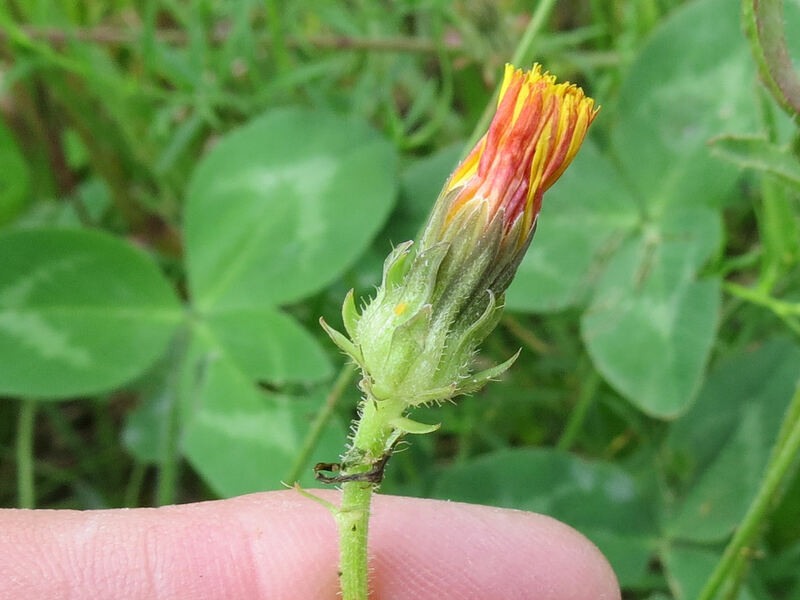 It says the involucre has inner bracts that hug the flower, while the outer ones spread. Check- see picture above! 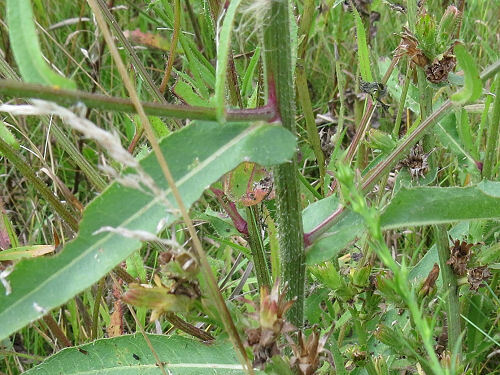 Lower leaves narrowed into stems while the upper ones are clasping. Check! Shapes of leaves highly variable, toothed, not toothed, lance-like. Check! This 1885 illustration is by Prof. Dr. Otto Wilhelm Thomé Flora von Deutschland (public domain), and it's my tentative confirmation that I did my work well, albeit slowly. I think it's a match. If you are ever wondering what to do with a spare day, just try keying out a plant, cold. This took hours, and that was with a fairly certain ability to eliminate huge groups of choices. And this, my friends, is why I don't do grasses. They have an entirely different vocabulary set, and I only know maybe 10 or so that I can eliminate from the vast unknown. Did you have fun? Haha. How Do Plants Make You Feel?